By the way, I don't have your program, I'm just guessing. And also, when you use that icon to post a jpg it may not show up right away. Hit refresh on your browser and it will be there in a minute. Frodos Majik wrote: I will say this much - it is done with tribal art and the girls will have two choices to root for not. Thanks for noting Mike's "GRRRRRRRL" kite. I thought it was just me! After all he wouldn't join us in the sewing room ... stayed off in a corner by himself. Didn't finish along with all of us ... worked under the cover of darkness. And finally, he's only flown it after dark ... doesn't want the biker gang next door to see his PINK kite. Plus, I think he used Photoshop to darken the pink in the picture he posted. I remember it being more pink than that. Wonder if he'll fly it at KP7 ... probably not! Thanks Mike, I had talked to the layout guys at work too. They said the same thing about exporting it to the computer. I guess for as many different programs out there, they still have similar ways of operating. and Tom you sure you want to say such hurtful things about a BIG BURLY BIKER like Mike? He is in touch with his feminine side and NOT afraid to show it. Dont forget we ALL saw you sitting behind the sewing machine too. Even if it wasnt pink. Frodos Majik wrote: and Tom you sure you want to say such hurtful things about a BIG BURLY BIKER like Mike? Hurtful things about Mike? Never do it! Pull his chain? Yep, every chance I can. Do you have any idea how much Mike has cost me? With a simple smile and a "want to fly my kite" he has put my kid's inheritance at risk. A full kite bag, trips to California, etc. Are you trying to say that the line between sewing a kite and sewing a pink kite is extremely thin???? That's a really cool design, Ken. Maybe you could photograph all the steps as you make it. It would be a nice tutorial on applique. I was maybe think about talking to the Grand PooBa for some help there. (Mike ) I got it all printed out and the twenty sheets of paper glued together., but am not sure how to going about transferring it to material. I do have a few ideas but I am not which way to go. So.... maybe after KP7 we could get together and play with it? Mike wrote: That's a really cool design, Ken. oh and start scaling it up to bigger BIGGER. Awesome design, I like the tribal look. I like Mike K. he always ignores the childish behavior on the forums and brings the kids back in line by asking meaningful questions. Anyway, Pink is kewl, but Razzle-Dazzle-Berry rocks!! If anyone needs one of those clear quilting rulers like we used in the class, Michaels is running a 50% off coupon in the Sunday paper. It's good today and tomorrow only. In the same ad is a 40% coupon good for Tues-Sat. May be worth the cost of a paper if you don't already subscribe. Get a cutting mat one day and the ruler the next day. Well it's finished! All the applica work is done and I flew it today. Now for the pink, not so manly, but it has a special purpose. When we are doing ROK battles and allowing members of the crowd to fly in rok battles, I am sure that these bikini wearing beauties at the beach will want to fly my kite and when finished and they win with this beautiful kite, I will be the recipient of a very grateful hug. Yowsa! Awesome! I love it! The femmes will love it too. Well got them put together yesterday in a couple hours. Everything went well till i got to the second half of the prussit knot for the tensioner. after some deep thinking and looking at it I finally figured it out, or i think i did. I did the spar pockets on the green one first and noticed that I didnt put them out far enough causing the spars to bend when installed. So I hacked about a Â¼" off the top and bottom. The Red one was second and only needed a little shaved off, and of course Third time was a charm. I figured it was easier to cut the spar than to re stich the pockets. actually she wouldnt let me take one without her being in it. of course I had to take it outside and see what would happen. Too bad there wasnt any good wind. Not that the front yard is a good place. Questions I do have..... How much bend in the spars? Top vs bottom, wind condition etc. And how about bridal tunning? This is something either im over thinking or just have not gotten the feel for. It doesn't hurt to repeat the link, but it was also mentioned back in post #82. Mike S. showed us how he tied the prusik in hand. You can do it that way and then slide it over the spar. Mux11 wrote: Questions I do have..... How much bend in the spars? Top vs bottom, wind condition etc. Nice job on all the Roks! You guys are gonna have fun at your Iowa fest. Everyone should bring them to Grinnell too! I bend the top and bottom spars about 6" or so. More bend makes it more stable. I bend the top and bottom the same. Tuning: first adjust the tow point--where the flying line attaches to the bridle. It will be somewhere near the middle. 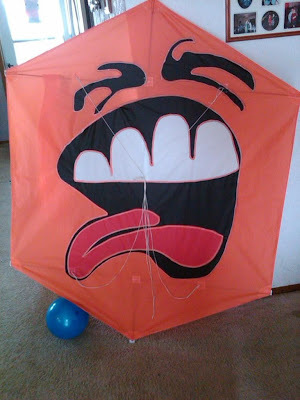 If it doesn't take off, move it up toward the nose of the kite. If it spins too much or flies right overhead, move it down toward the tail. After this, if it tends to drift to the left or right, slide the knot where you prusiked the middle bridle segment onto the top bridle, left or right. After the sail stretches, you may have to readust. Probably back to the center. I think mine all fly from the middle, so don't mess with it too much. And don't try to fly it down low in swirly winds. I can't fly anything in my backyard. I noticed the same thing when we (you) ordered shirts for us. Would it be possible to have this function? When we're buying something have a separate area where individuals can go to post what they want to order ... and where only the posting member can change their entry. It could also be used as a "who's going to attend" headcount for events. We don't have anything quite like that, but you really wouldn't believe how much time I spent reading & re-reading all those posts. People ordered one thing early on and then changed it later. The same for the shirt orders. One idea is to start a thread just for orders. If you change your mind, you must edit your post, not post an additional post. I'll still need to monitor it though. Folks can't help themselves and will post postings that aren't orders. It will be easy enough to catch posts that aren't orders and delete them, but catching duplicate posts that are changed orders will be more work. Also, I always get PMs and emails and phone calls in addition to the forum posts. Some folks prefer the privacy of email or a phone call to public forum posts. We could try a google spreadsheet, but that's harder for newbies to work with. I could let everyone order their own separately but then we would have had a lot of money wasted in shipping costs and we would have lost the bulk discount on the spars. The other problem with the bulk orders, is I somehow lose a little money on the deal. I tried a different tack with the last T-shirt order and ordered extra shirts which got a bigger bulk discount. I haven't sold many of those and still haven't broke even. If I sell more and actually come out ahead, the money will go towards paying our web hosting fees. Anyone need an IKE shirt for $15? Anyway, if you have any ideas, please start a *new* thread and I'll copy this over to the other thread where we can continue the discussion. Mike, here's a tangential suggestion...put your inventory of IKE items in a Google spreadsheet that you can easily refer people to or have a link to. Or any kind of page...just thought the Google Doc would be easy. THanks again for this build!!! they become quick to make and make great gifts! Last edited by Mux11 on Sat, Apr 03 2010, 09:34 PM, edited 2 times in total.